Looking to buy safety jackets in Rochester NY, Ithaca NY, and Western NY at competitive prices & with exceptional service? The Duke Company proudly carries the finest Safety Jackets – ANSI 107-2010 Class 3 2-in-1 Bomber Jacket with X-Striping in High Visibility Yellow and High Visibility Orange. We offer convenient pick-up and prompt delivery through-out Rochester, Ithaca, Syracuse, Western NY, and Upstate New York. Notably, compliant with rigorous CSA (Canadian Standards Association Z96 standards. Meets ANSI / ISEA 107-2010 Class 3 standards. High quality details include fully-taped seams, concealed and detachable hood. To keep the cold out, equipped with elastic ribbed waist, writs and color. Slash pockets are located in both the exterior and interior. Sizes: Medium, Large, XL, 2 XL, 3 XL, 4 XL, 5 XL. 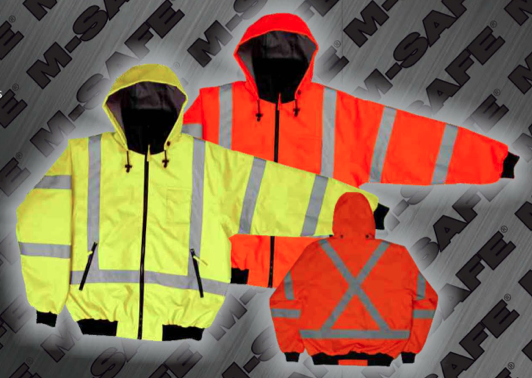 We proudly carry the premiere products of Majestic, America’s standard for high quality, high visibility safety gear. The Duke Company proudly carries a full line of the highest quality High Visibility Safety Gear that is ANSI Approved, ASHTO Approved, DOT Approved and OSHA Approved. We are able to customize your company’s high visibility gear with your company’s logo or slogan, whether via silk screening, creating custom 3M reflective logos, embroidering patches or via full color heat transfers. Our rigorous standards enable us to have selected the finest personal protective gear that is specifically designed for construction professionals. The Duke Company is proudly recognized as a one-stop shop for Safety and Personal Protection Gear, Traffic Safety Supply, and Trench Box Safety and Trench Box Rental. Our expert team of safety specialists would be glad to assist you with convenient pick-up, prompt delivery, custom embroidery and special orders.